What to Expect From SPX3001? Sun Joe is a tool manufacturer that stands on the frontline when it comes to producing reliable pressure washers. Their wide variety of power washers can answer all of your cleaning challenges. In the following section, we will provide an honest and unbiased Sun Joe SPX3001 review. This way, we can get you through the details you need to know before you decide whether you want to buy this model. The SPX3001 SunJoe is similar to its SPX3000 model, with just a few modifications that we will also address. First of all, let`s talk about the power of this Sun Joe model. It packs a 14.5-amp/1800-Watt electric motor that can provide up to 2030 PSI and 1.76 GPM, which falls under the category of medium-duty pressure washers. A test was definitely needed because even medium-duty pressure washers can sometimes surprise you with their versatility, which SunJoe manufacturer takes pride in. The total cleaning power of this unit is 3572. The washer itself is designed to look simple and modern, with its green colored parts and slim frame. Considering that it belongs to the group of power tools where everything is result-oriented, it’s a refreshment to see some innovation in the design. The unit weighs around roughly 36 pounds. The housing of the pressure washer is quite portable with its 2 plastic wheels that proved useful for every type of floor we have carried it across. Now, when we tested this pressure washer and seen it in action, the 34-inch long extension wand proved quite useful and easy to handle. It is attached to a 20-foot long high-pressure hose, so you can cover a lot of area in one go. To make the unit even more mobile, the power cord gives you 35 more feet in length. If by any chance you want to stop the pressurized water from coming out, SunJoe created a Total Stop System. It breaks the water flow as soon as you let go of the handle, preserving water, power and prolonging the life of the electric motor in the process. We have also tried to approach several different surfaces with the provided quick-connect nozzle extensions (four of them being different angles, and one of them being for soap washing). They showed to be quite handy, and the soap one helped with a more thorough washing. Speaking of soap, this model has a 40.6-oz detergent tank, if you feel that additional agents are needed besides the regular water pressure. The difference Between SPX3000 and this model lies in the hose reel on-board that enables easier storage. The hose reel makes this model especially compact, which lets you reel in the extra hose you don’t use. This gives you the option to tightly pack the washer away when you`re not using it, protecting the high-pressure hose in the meantime from kinks and marring. No more tripping over it and getting stuck. You will get a full 2-year warranty on the pressure washer, with all the standard necessary support included. The Sun Joe company provides all of the necessary spare parts that you might need, so repair is never an issue. When you are browsing their units on seller platforms, they always suggest a line of their detergents you can order with the washer, which is a well-designed option. This pressure washer dominated when we challenged it with most types of dirt, grease, moss, oil and even some sturdier heavy stains. This model proved great with car washing, cleaning wooden porches and stairs. Seasonal washing around the yard was handled with ease, and even carpet washing was not a hurdle – this pressure washer shined through and through. The biggest pros of the SPX3001 are its mobility and versatility. For a washer that is powered by an electric motor, this amount of power is one of the best you can get, and it does its job pretty well. If you have a vast area to cover and clean in your yard, the mobility of this model will surprise you. This pressure washer cannot fulfill every need that you might have, because, as mentioned, it is powered by an electric motor. It’s a residential pressure washer intended for light to some medium duty cleaning tasks, but if you need a more serious unit, you should check out our gasoline powered pressure washers. The soap dispenser on Sun Joe SPX3001 is kind of robust. Even though demands vary, this model will help you finish any job around the yard. 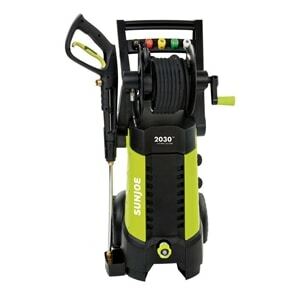 The SunJoe company has solid recommendations, and this specific model is a well-made medium-duty pressure washer. It is also fairly affordable, while the assembly is easy. It is important to remember that this famous electric pressure washer will not be able to attack the hardest of stains, but it will work well with occasional and seasonal tasks. There you go, the essentials of this model packed in a brief Sun Joe SPX3001 review. We hope this helped, and, of course, if you have any further questions, feel free to ask in the comments below.